We cut our teeth on solar thermal and installing systems for homes and community projects from Brixham to Dartmoor. They can be a great contribution to a well designed and controlled hot water system. How much of a contribution depends on many factors. We would survey your property, gather information from you and give you an estimate. We have some customers that use no other hot water source for a good part of the year. To maximise the benefit of a solar hot water system, we can specify our own cylinder designs. This allows us to future proof your cylinder by putting in extra coils, or extra fittings to allow connection to other heat sources or loads. We have our cylinders made by Newark Copper Cylinders, a family business of over thirty years. These are fitted with very thick foam insulation to maintain the highest efficiency of heat storage. 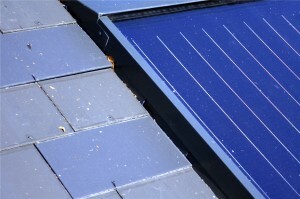 As energy prices increase, the simple benefits of Solar heated hot water, become apparent to more and more people. If you think you might be interested… call us for a chat. Heating Chudleigh community swimming pool using a solar thermal system.